Ancient Greece played a major role in world history from 750 B.C. to 146 B.C., providing the foundation of Western civilization. Greek culture had a powerful effect on the Roman Empire in language, politics, science, and the arts. A Greek heavy infantryman, known as a Hoplite, was the central element in Ancient Greek warfare. The most well-known hoplites were the Spartans, who trained from childhood in combat and warfare. 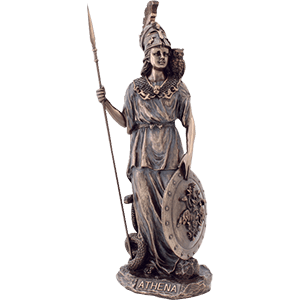 We carry an excellent variety of merchandise inspired by the culture of Ancient Greece and these fierce warriors. 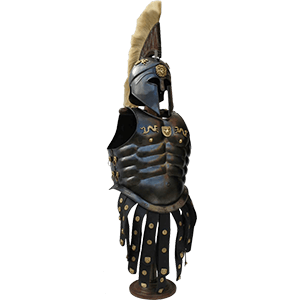 We offer Greek armour, Greek clothing, Greek helmets, and Greek weapons for reenactors and collectors, as well as Greek decor, Greek jewelry, and other Greek collectibles to add Hellenistic flair to your daily life. Take a moment to browse, and you are sure to find excellent pieces that catch your interest. Greek soldiers and citizens wore a variety of unique apparel specific to their culture and lifestyle. We offer an excellent selection of Greek attire, including Greek tunics, Greek belts, Greek capes, and Greek sandals. A classic piece of Greek apparel, the tunic was a lightweight garment worn under armour and in daily life. Leather belts tied tunics closer to the body and provided a way to carry swords or other weapons. Hellenistic sandals and capes protected the wearer from the harsh sun in Greece. Our Greek clothing includes a variety of authentic period styles as well as modern adaptations. Certain pieces are inspired by the action film, 300. 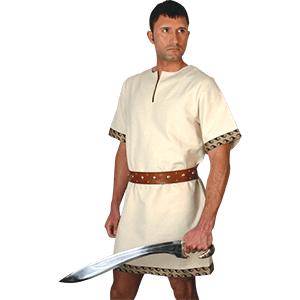 Choose the perfect pieces for your reenactment, stage performance, or costume party from our various pieces of Greek and Spartan clothing. We carry an excellent selection of Greek helmets inspired by the headgear worn by Hoplites and other Greek soldiers. The Corinthian helmet originated in Ancient Greece, named for the city of Corinth. Later versions of the Grecian helm covered the entire head and neck with slits for the eyes and mouth, which made it very hard for soldiers to see and breathe. Similar to those of the Romans, many Greek helms had large curved projections to protect the nape of the neck and dramatic crests over the top of the cranium. 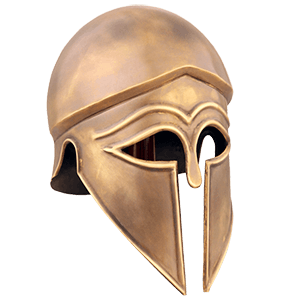 We offer brass and steel Corinthian helms, Hoplite helmets, Trojan helms, Spartan helmets, Attic helmets, Macedonian helmets, and more. These reenactment helmets are ideal for LARPers and collectors. Fans of Greek culture and history are sure to appreciate the lines of Greek jewelry offered here. These Greek accessories are perfect for anyone enamored with this ancient culture. Featuring designs ranging from mythological figures to Grecian coins, each piece of Greek jewelry represents an aspect of Greek culture. This collection of Greek pendants, Greek bracelets, Greek rings, Greek earrings, and other Greek accents shows off the owl of Athena, other animals important to the Ancient Greeks, Medusa, Spartan helmets, and various symbols and icons. Made from pewter, gold, silver, and other fine materials, this Grecian jewelry works well for everyday wear, costume attire, or special occasions. Take a moment to browse, and you are sure to find something that catches your eye! 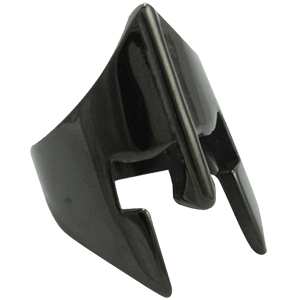 We offer a full line of Greek shields inspired by those carried by Hoplites and Spartan warriors. 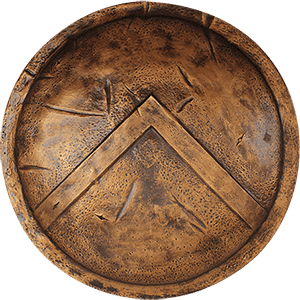 Our wooden Greek shields and steel Greek shields are great for Renaissance fairs, LARP events, or historical reenactments. These Hoplite shields, Spartan shields, and Trojan shields come in fully functional and decorative designs. A number of our round shields are made from smooth composite wood with hand-painted Greek designs and symbols, including Medusa, helmets, scorpions, Lambdas, Pegasus, ships, and fish. Certain shields feature rounded cutouts on the top or sides for a unique look. Our steel Grecian shields are great for SCA events and sword-fighting, while other decorative shield designs look great displayed upon your wall or as part of your Spartan costume. The Celt-Iberians of the Hellenistic period were justly famed for their iconic weapons, such as the falcata and kopis. The Greek falcata was one of the most devastating swords ever made in Greek history. The inward-curving blade delivers a tremendous blow that could split both shield and helmet. Considered to be of Greek or possibly Etruscan origin, this Grecian sword spread into Southern Russia and Spain, intimidating even the Romans. 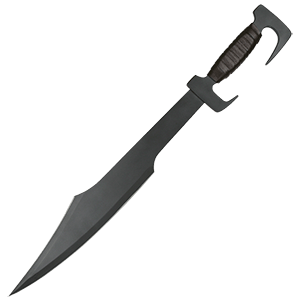 We provide an excellent variety of decorative and functional Greek swords and Greek daggers for reenactors and collectors. Our hoplite swords, falcata swords, Spartan swords, Greek kopis, and other Greek blades are made with attention to detail and excellent craftsmanship. Certain pieces are also inspired by the Frank Miller film, 300. The Hellenistic period played a major role in the development of the Western world, influencing warfare, science, language, politics, and the arts. Show your appreciation for the culture of Ancient Greece with our variety of Greek decor and Greek collectibles. 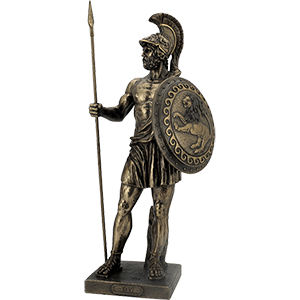 Inspired by Greek mythology, literature, and history, our Greek statues include figures like Zeus, Athena, Socrates, Achilles, Hoplite soldiers, King Leonidas, Aristotle, and many more. Our Greek gifts and other merchandise extend even further with a selection of Greek keychains, pencil toppers, Grecian coin replicas, thimbles, and chess sets. Pick out a fantastic Greek plaque to hang on your wall, or show off a Greek end table in your home or office. History buffs and collectors are sure to appreciate the wide range of products you can find here! After an intense battle that left a great horde laying at his feet, our hero takes a moment to brood over the gory scene. 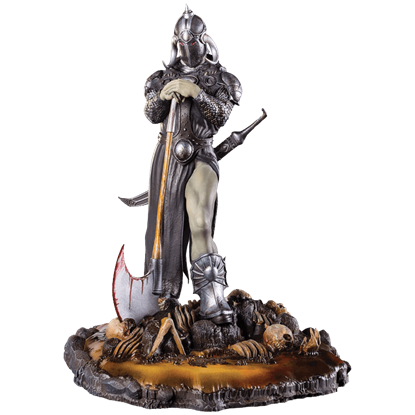 The Frazetta Death Dealer 3 Statue is the latest in a series that honors the fantasy art of Frank Frazetta.